The shape of drops and bubbles is the centre of interest for many interfacial scientists. 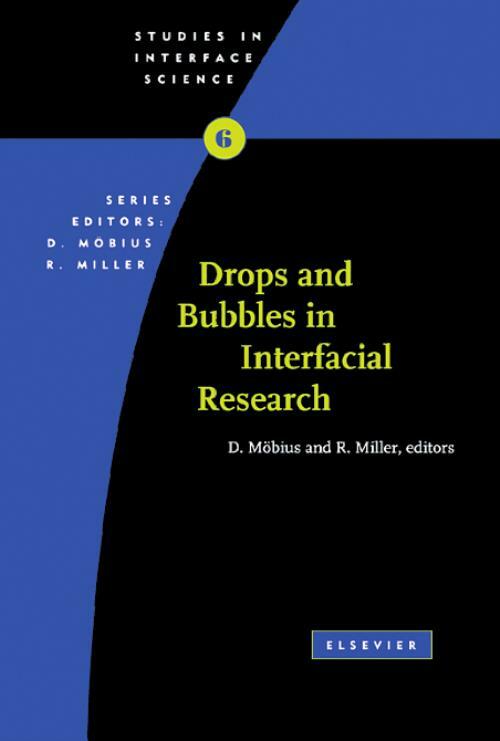 This book describes the most recent accomplishments to make use of drops and bubbles in fundamental research and application. After a general introduction into the mechanics of liquid menisci, chapters are dedicated to methods based on drops or bubbles. The chapters about the three main drop experiments provide the theoretical basis, a description of experimental set-ups, specific advantages and disadvantages, correction and calibration problems, experimental examples and their interpretation: pendent and sessile drop, drop volume, and spinning drop technique. The chapter about capillary pressure methods summarises different techniques and gives examples of applications, for instance measurements under microgravity. The maximum bubble pressure technique as a particular capillary pressure method is described, with emphasis on the most recent developments which made this technique applicable to extremely short adsorption times, down to the range of milliseconds and less. Problems connected with aerodynamics and hydrodynamics are discussed and used to show the limits of this widely used standard method. The oscillating bubble technique provides information not available by other techniques, for example about the dilational rheology of adsorption layers and relaxation processes at the interface. The description of rising bubbles in surfactant solutions will contain the hydrodynamic basis as well as the theoretical description of the effect of interfacial layers on the movement of bubbles. Besides the theoretical basis experimental data, such as water purification, flotation processes etc. and the relevance for practical applications will be presented. The chapter about lung alveols demonstrates how important bubbles built by biological membranes are in everyday life. The relevance for medicine and biology as well as model studies is discussed. An important example for the application of drops is metallurgy, where the surface tension of metals and alloys is an important parameter for many applications. The chapters on drop shape analysis by using fibre technique and on force measurements between emulsion droplets are of much practical relevance. Lists of references and symbols are given separately at the end of each chapter while a common subject index is given at the end of the book. Foreword. The Laplace Equation of capillarity (J. Gaydos). Axisymmetric Drop Shape Analysis (ADSA) and its applications (P. Chen et al.). The drop volume technique (R. Miller, V.B. Fainerman). Spinning drop tensiometry (A.M. Seifert). Capillary pressure tensiometry and applications in microgravity (L. Liggieri, F. Ravera). The maximum bubble pressure tensiometry (V.B. Fainerman, R. Miller). The oscillating bubble method (K.-D. Wantke, H. Fruhner). Physico-chemical hydrodynamics of rising bubble (S.S. Dukhin et al.). Pulmonary surfactant and biophysical function (R. Herold et al.). High temperature tensiometry (A. Passerone, E. Ricci). Dynamics of the impact interaction between a fine solid sphere and a plane gas-liquid interface (A.V. Nguyen, H. Stechemesser). Interactions of emulsion drops (P.D.I. Fletcher). From stalagmometry to multianalyser tensiography; the definition of the instrumental, software and analytical requirements for a new departure in drop analysis (N.D. McMillan et al.). Subject Index.